When in Scandinavia: Museum Overdose! If I had to write a list of things I find cool, the word “museum” would definitely be there. Perhaps quite near the top. As a self-proclaimed museum junkie, I obviously went to quite a few museums during my very recent trip to Europe with my older brother. So, why just Scandinavia? Well, I have been interested in certain aspects of Scandinavian countries, and Denmark in particular, for a while now – mostly because of their sustainability efforts, two awesome Danish TV shows Borgen and Forbrydelsen, and remnants of childhood fascination with the Vikings from Asterix and Obelix. Other than that, however, I have to admit that I didn’t really know much about those countries. The good news is, after a series of museum hopping, I can say that I have learned a great deal of new things about the three countries I had the chance to visit: Norway, Sweden, and Denmark. And most of the museums that I visit are freaking awesome, too! 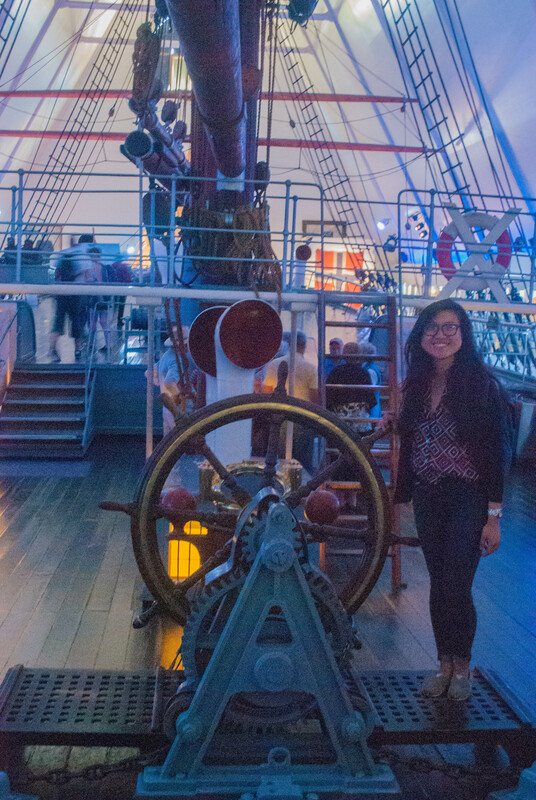 So here it goes, the first story about my trip this summer, in which I talk about two very cool things: museums and Scandinavian countries. The first country we visited was Norway, first stop: Oslo. There weren’t really a lot of things to do in the city that caught my interest. That said, I like the fact that Oslo is very well-organized and pedestrian-friendly. Anyway, I managed to convince my sole travel companion, who is not a big fan of museum, to visit two museums in one day: Vikingeskibsmuseet, or Viking Ship Museum, and Frammuseet, or Fram Museum, the latter being my personal favorite. The ships at the Viking Ship Museum are burial ships during the Viking Age. There are three ships being displayed there – Oseberg (the most famous one), Gokstad, and Tune (pictures below), each is dedicated to people from different statuses, storing different types of valuables, and having different shapes and sizes. The Viking Museum is a pretty small museum and it didn’t take that long to go through even all of the collections. It’s pretty interesting for me personally, though I would say it can be a bit dull for people who are not into museums and/or Viking history. It’s a very old school, traditional museum – three displayed ships, each having a wooden plaque to describe it, and some grave goods labeled with some information, all of which I find very informative, but frankly, not that appealing. That said, the ships are pretty extraordinary, especially the Oseberg ship! Loving all the details, and it’s very well-preserved too. The Viking spiral of one of the ships. I forgot which ship it is from. An emblem on a bucket that is part of the grave goods found onboard the Oseberg Ship. Very subjectively speaking, the Fram Museum is awesome!!! (Yes, it definitely deserves all three exclamation marks.) It is such a great ship, not that I know that much about ships. I have an interest in polar expeditions, so maybe that’s why I find it extremely fascinating. Onboard the one and only Fram! Roughly a century later after all those great explorers trying to discover the cold unknown, but still as exciting! They have extensive collections, detailed and engaging descriptions about polar expeditions, especially on the notable Norwegian explorers, namely Fridtjof Nansen, Otto Sverdrup, and Roald Amundsen. I especially like the part about how the Western explorers learned a lot from the Inuits, something that I wasn’t really familiar about prior to the visit to the museum. Some other things I find interesting in the museum is quite a lot of information on the significant scientific contribution of these polar expeditions, the expedition sponsors, and the attractive kids section equipped with a few educational and fun games! A diorama on polar expedition, not sure if it depicts a specific event though. A typical sleigh with all the necessary equipments. Dogs played such a major role in polar expeditions. The weakest dogs were typically shot and fed to other dogs. Ship’s medicine chest. Slightly related, scurvy is the most common disease in polar expeditions. The best, and the main, exhibition is obviously the ship itself. I really enjoyed reading some excerpt from Fridtjof Nansen’s diary during his expedition in finding the Northwest passage for my seminar class back in first semester of college, and it was great to be able to step on the very same vessel he was in! You can go inside the actual ship, from the deck to the cabin and even the engine room – all of which still retain the original interiors. Tromsø Museum is a pretty small museum, situated in the city of the same name Tromsø. The town itself is also very small, in my opinion, despite being the largest town in Northern Norway. I would say that there is nothing special about the museum apart from the exhibition about the Sami people – indigenous people of a region named Sápmi, which also includes northern part of Norway, in addition to that of other countries (Sweden, Finland, and Russia). I especially like learning about the way they live and their artworks! There are some neat miniatures of the traditional houses, also a nice exhibition on the history of Sami people in Norway. It tells stories about the Norwegianization efforts, carried out by the government, that thwarted the preservation of Sami traditions and culture, the discontinuation of the policy, and subsequent efforts to promote and preserve the identity of Sami people. I’d never heard of Sami people before, so that was very informative. Model of a typical Sami hut, called Goahti. Various types of Sami hats, very pretty! Especially loving all the bright colors and unique shapes. After a rather lengthy stay in Norway, the next destination of our trip was Sweden. The next two museums are situated on the island of Gjurgården, Stockholm. Gjurgården is a charming island with tons of museums, and is home to the Gröna Lund’s Amusement Park. Spritmuseum (Spirits Museum) is perhaps the most fun of them all. The first couple of rooms that we went to had various artworks dedicated to the infamous Swedish brand Absolut Vodka. Brownie points if you spot the Absolut bottle! Some of the artworks that I can recall include remake of Impressionist and Renaissance paintings by substituting the most notable item of the painting with an Absolut bottle, pop art with an Absolut bottle as its centerpiece, and one plain canvas that is soaked in a certain amount of alcohol every year (pictures above). Super entertaining and fun to see. The next exhibition is about beer making and the history of beer in Sweden. The room is bright and nicely decorated. 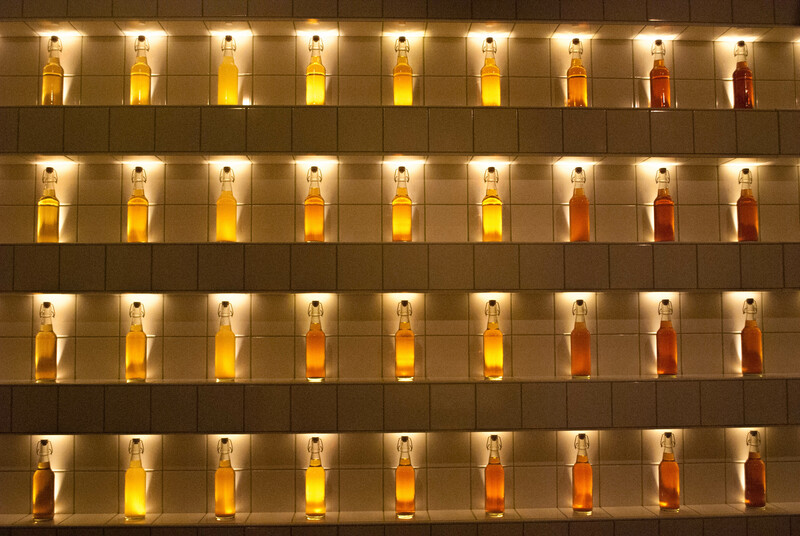 Beer bottles with different shades of orange can be seen on the far end wall. Upon entering the exhibition, visitors can grab a sheet of beer quiz. By presenting the completed quiz, they can get a small badge that has a beer icon courtesy of the museum. They are then able to walk through a series of numbered stops that contain information, mostly about the history of beer in Sweden, to answer the questions. Each display is really well-thought and informative, a huge shoutout to the exhibition interactivity! Vasamuseet (Vasa Museum) is located pretty close to Spritmuseum. It displays the Vasa ship that sank in the 1628. The ship itself looks amazing! It’s still very much intact. The detailed carving on the ship surface is simply gorgeous. The colors have faded away, but there is a miniature of the ship with all the colors it used to have that have been determined from a previous study. The detailed, colored carving of the miniature of the ship. The carving of Sweden coat of arms on the actual ship. A few remaining bones of some people who sank with the ship are also displayed – some still have their clothes around them, which can be used to determine their social status. The body remains were used to determine some aspects of life onboard, such as their diet and the diseases prevalent in the ship. One thing for sure, the museum did a great job in curating the collections! All of the exhibitions are really nice and very visually appealing. Last but not least, is the Nationalmuseet (National Museum) of Denmark, situated in Copenhagen.The admission is f r e e, which is great (especially for college students like me!). The museum is pretty good. However, after a while I eventually got pretty tired of reading, haha. The amount of the information started to feel a bit too much to take in, definitely a lot! The exhibition I like the most is the one on the second floor, which includes the 1600s-2000s time period. It’s definitely interesting to see how Denmark has transformed in the past four centuries. These two pictures are among the very few pictures I took during my visit, as I didn’t take my camera with me. A room in a typical bourgeois’ apartment in the 1700s. A living space of person from the lower-class economic background, also in the 1700s I believe. It consists of a bed, a couch and a table, and a small kitchen (in the left, not pictured). I guess that’s it, a recap of my latest museum marathon, and part of my European trip this summer. It was a very fun adventure spent with a very fun travel companion, and I definitely had a great time!